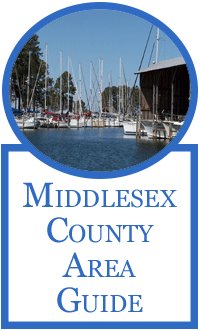 Looking to purchase a Virginia waterfront property or are you recently new to Chesapeake Bay region? Need help finding your way? Help is here in the area guides! Where the living is enhanced at every turn with views of the Chesapeake Bay, its rivers and creeks. Fields of corn and wheat hug rural roadways. Vibrant villages, with quaint shops and restaurants greet you with refined southern hospitality and charm. Just far enough away for you to experience the road less traveled. 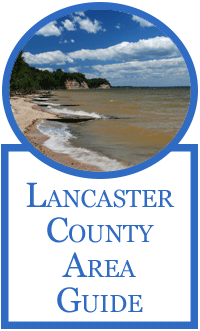 Situated in the heart of the Northern Neck, where the Rappahannock River meets the Chesapeake Bay, with superb museums and galleries, seasonal events, and entertainment plus award winning amenities, Lancaster County is the hub of all that the river region has to offer. The "Pearl of the Chesapeake!" 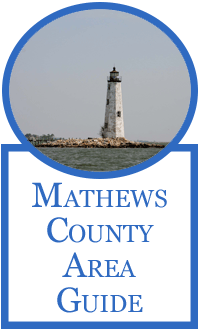 Mathews is Virginia's second-smallest county, land-wise, with over 200 miles of Chesapeake Bay shoreline. Rich in centuries of maritime tradition, the county's quiet country roads lead past stately historic homes to the river's edge and a life of boating, kayaking, fishing, sailing, and just plain un-commercialized relaxation. There is a wonder assortment of specialty shops and restaurants throughout the county, with the majority lining the Historic Mathews Courthouse District. The annual festivals, such as Mathews Market Days, the Gwynn's Island Festival, and the Tour de Chesapeake, provide a showcase for community pride and creativity! Bordered by the Piankatank River to the South, Chesapeake Bay to the East and Rappahannock River to the North we have our Rivah Lifestyle mixed with beautiful history, great seafood, friendly people and great breezes! Middlesex is known for the Deltaville Deadrise boats, Deltaville Maritime Museum, Rappahannock River Oysters gorgeous walkable harbor Town of Urbanna, the home and resting site of the one of the most decorated Marines, General Chesty Puller and the unforgettable Official state oyster festival, the Urbanna Oyster Festival. We are very proud of our waterfront heritage and represent it in three different ways at the Middlesex Museum, Deltaville Maritime Museum and the James Scottish Mill Factory Store (Old Tobacco Warehouse). We carry on our history by celebrating our expansive waterfront through boating, kayaking, paddle boarding and just relaxing by the Chesapeake Bay. We'll show you a great time where you can unplug, unwind and enjoy life! Think Colonial Williamsburg, meets Jamaica and an old Salty Waterman! We are living the island lifestyle right here in Virginia on the gorgeous Chesapeake Bay!